This is the second entry in the series of posts on the state-at-purchase of the building. The first post installment included a tour of the ground floor. As throughout this series, the photos here were not originally intended to be “good photography”, but rather reference photos, so please lower expectations accordingly. 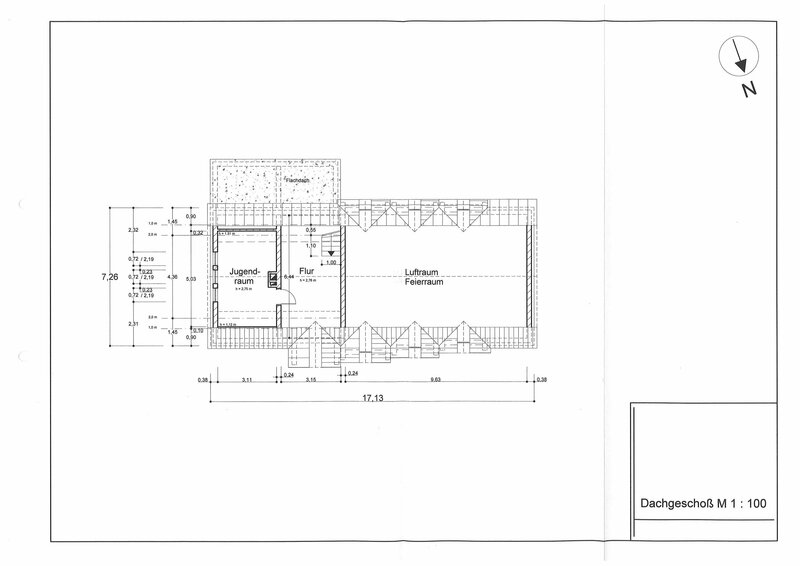 Like last time, I’ll start with the floorplan. View as you go up the stairs to the upper floor. 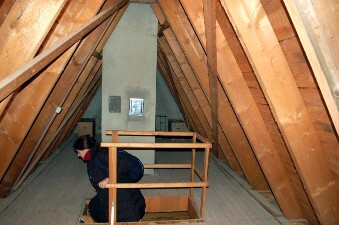 The attic ladder is extended in this view. 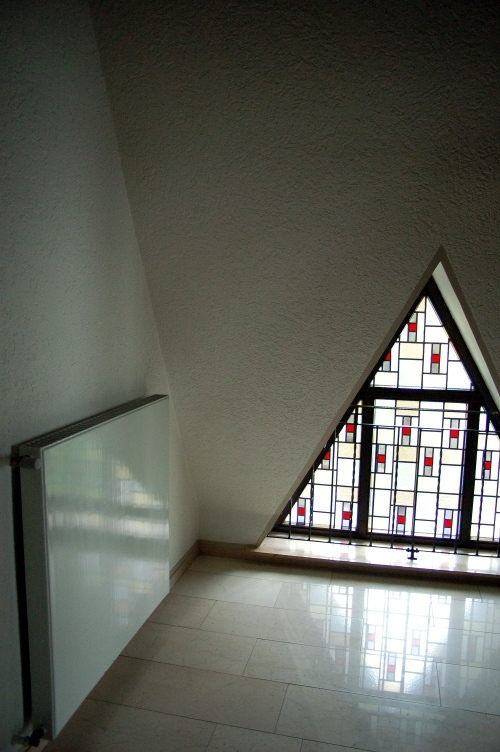 Triangular window above the front door. The colored glass is not dark at all. The stairs and the large hallway into which you arrive all are laid with the same stone flooring as the entrance hall below. There’s only one window: the triangular transom from above the front door. The stained glass is fairly light colored for a stained glass window. Our visits took place on rather gloomy rainy winter late afternoons, which contributes to the impression that the windows are opaque and dark. 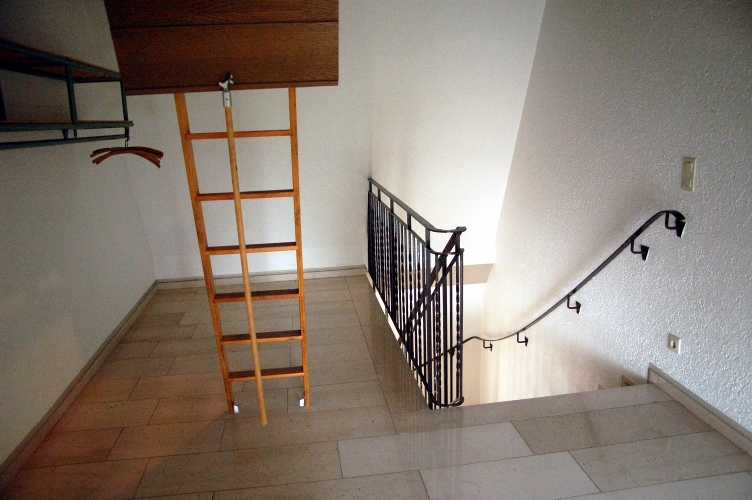 The next photo gives a look back at the stairs and the little neighboring coat rack area. 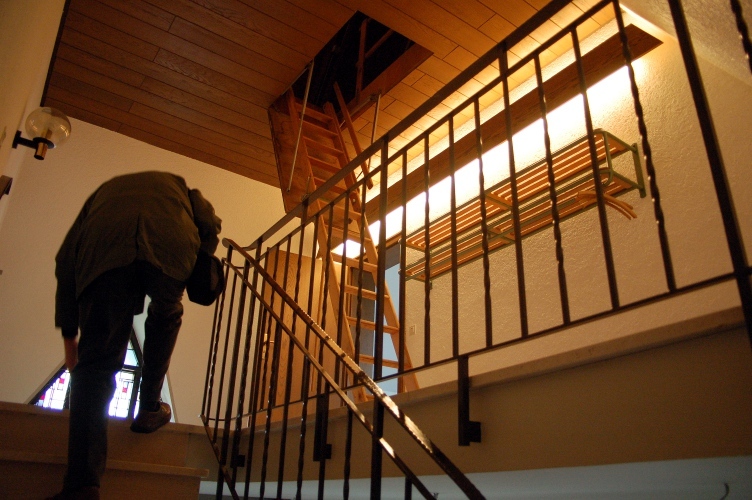 The attic stairs are pulled down in the picture, but we’ll go up them later. Look back at stairs and the small coat rack area next to them. The ladder to the attic is extended. Instead, first we’ll go into the room labeled “Jugendraum”. This was used as a sort of creche to store kids during church services. I guess the boards over the radiators are there for child-safety reasons. This floor has the same carpet as in the Amtszimmer and main hall downstairs. We’re planning to eventually use this area as office space, and to add a small powder room in the corner. Now we’ll go up to the attic. We have a challenge with fitting a permanent staircase leading up there. 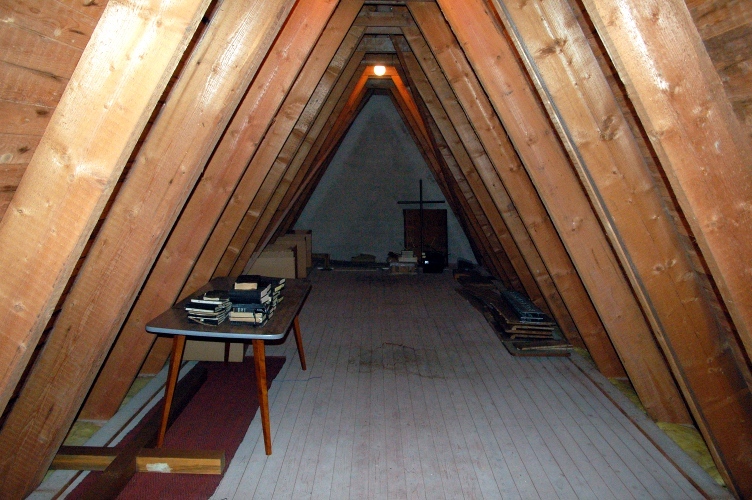 The cross-section of the upper floor plus attic is an equilateral triangle. There just isn’t a whole lot of space to traverse horizontally. Coming up into the attic. The area behind the chimney could do as storage. The attic itself stretches the whole length of the building. The bits of yellow near the floor are the building’s insulation. It’s more insulated than you’d expect for a non-residential building from the seventies. It’s a little too narrow for comfortably fitting a double bed, but I think it would be a nice office area, so I’ve claimed it as such for myself. The table in the last picture maybe gives some idea how this would work. 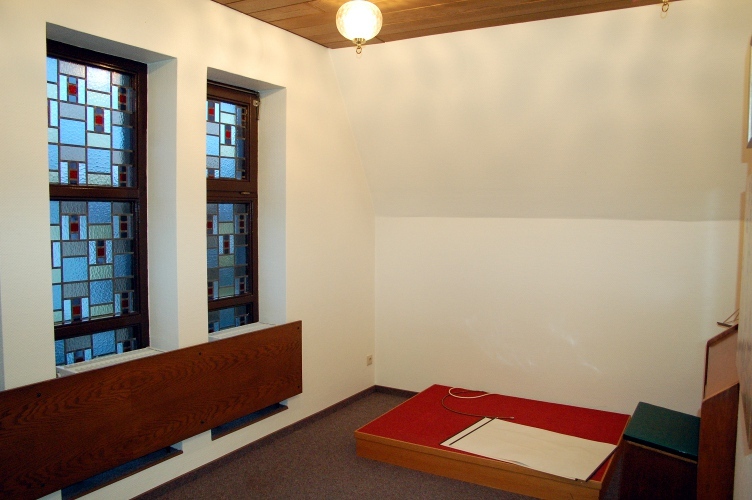 Of course, we need to insulate this space and add some windows. The view down the length of the attic. The table gives some idea how a long desk might stand. Need windows and insulation up here. On Monday, in the third installment I’ll show the basement, and talk a bit about some necessary practicalities.